The Days of Johann, an agility dog! : Now this is cool! We came across these today and thought they were sooo cool! 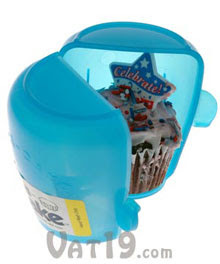 They are called Cup-a-Cake cupcake holders and they help protect your cupcakes from getting smooshed! There are little plastic prongs on the bottom for your cupcake so it keeps the frosting clear of the edges. Now what a great idea! You know what else they would be great for? Toss and treat dispensers for us pups for our training! And the site has a bunch of other unusual gifts and stuff. Very clever of you Johann to re-purpose all that stupid human detritus into something actually useful to us dogs.